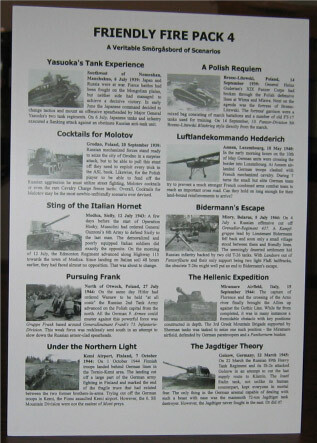 In just a few years, the Friendly Fire Pack series of scenarios have vaulted to the forefront of the “must get” scenario packs of the ASL world, achieving a very high reputation for quality, historicity, playability, and even proofreadability alike. In other words, Friendly Fire Packs have become synonymous with quality and that’s high praise. If that doesn’t get us free product, nothing will (Editor’s Note, 2009: alas, it did not get us free product). As Friendly Fire’s reputation has grown, so too has grown the number of people interesting in working with them or helping them. 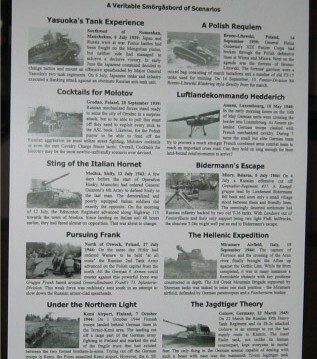 “Proudly produced in a whole bunch of countries,” announces the Friendly Fire cover sheet, and they are right. Although the two main honchos remain Mattias Rönnblom and Martin Svärd, there are more scenario designers and a whole host of new playtesters from several continents. 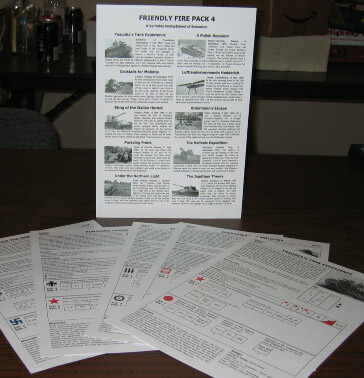 As with previous packs, Friendly Fire Pack 4 (FF4) contains a mixed bag of scenarios: Poles vs. Germans (Poland 1939), Japanese vs. Soviets (Manchuria 1939), Poles vs. Soviets (Poland 1939), French vs. Germans (Luxembourg 1940), Italians vs. Canadians (Sicily 1943), Germans vs. Soviets (USSR 1944, Poland 1944, Germany 1945), Greek/New Zealanders vs. Germans (Italy 1944), and Finns vs. Germans (Finland 1944). Because the pack is released annually at a Swedish ASL tournament, a number of the scenarios are suitable for tournament play. Overall, the scenarios are a good mix of small, medium, and larger sizes, with none of the scenarios being particularly large. One scenario uses some Desert rules, and two scenarios use OBA. One scenario, FrF26 (A Polish Requiem), uses ASLSK board t. Most of the scenarios have overlays. Several scenarios spark interest. 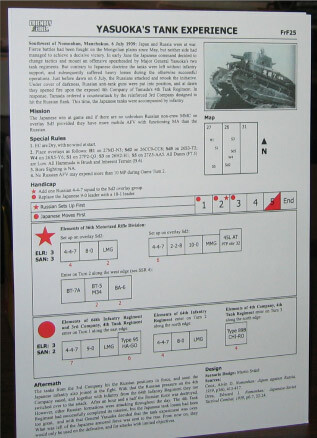 FrF25 (Yasuoka’s Tank Experience), a Japanese-Soviet clash on the Manchurian border, offers the novelty of Japanese-Soviet action as well as a manageably sized Manchurian scenario. FrF26 (A Polish Requiem) is a nicely balanced early war combined arms action with victory conditions that can add suspense to the last couple of turns. FrF29 (Sting of the Italian Hornet) is a meaty and balanced scenario despite a 1 ELR for the Italians! It is one of a number of good scenarios involving Italians that have been released in the past few years. FrF30 (Bidermann’s Escape) is a tiny, balanced scenario that can be played very quickly. FF4 is a product with great play value and belongs in the scenario collection of all ASLers.